Google Home gives you a completely new level of control over your smart home. Talk to the in-built Google Assistant to play music, see weather forecasts, make shopping lists, and control your other smart home products. It is a search engine, scheduler, personal assistant and speaker in one box, all without the need for a smartphone. With a simple "Ok, Google" you can ask it any question or use streaming services such as Spotify, Netflix or YouTube. Compatible devices can be easily connected via Google Chromecast, allowing you to stream your favorite TV shows and music without the use of a smartphone or tablet. But these are only some of the many features within Google Home. Here you can find all Google Home compatible devices and providers. The perfect home assistant for accessing music and video streaming content. You can ask Google Home to play a specific artist or even a playlist of an entire genre. Using it with Google Chromecast also lets you access streaming services such as Netflix and YouTube. Here, you can simply ask Google to play a specific show or video and it appears directly on your TV. The days of having to get off the couch or even take your phone out of your pocket are over. Google Home is also the perfect home assistant for families. Onboard are a range of features designed specifically for children, including games, trivia, and interactive stories. Extensive database: Unlike other manufacturers of voice-controlled Smart Home assistants, such as Amazon Echo, Google Home accesses the world's largest search engine and its database. You can ask it questions on virtually any topic: nutritional information, word definitions, traffic status or random facts. Google Home delivers accurate and detailed answers. Personalization: Want travel times for your daily commute or for a different journey without always having to give your address? Then save your address in the device and Google Home can tell you precise travel time as well as current traffic levels. High quality microphone: Google Home can also recognize voice commands from other rooms thanks to its long-range voice recognition, making it easy to operate from around your home. Strong data protection: Google Home saves all your information and data according to the highest data protection guidelines. For added privacy you can mute Google Home’s microphone. Music playback: Google Play doesn’t just answer your questions, you can play back music using voice commands. Using its powerful speaker, it plays high quality music through many well-known streaming services like Spotify, Google Play Music and TuneIn. You can also store your favorite radio stations, for quick and easy playback. Intuitive control: Google Home is not only voice operable - it can also be used effortlessly via touch screen. This allows you to play music, change the volume, set an alarm, mute the microphone, and make a request - all with the touch of a fingertip. Ever-growing compatibility: Google Home doesn’t just make everyday life easier by answering important questions, you can also control other Smart Home products using only your voice. Combining the Philips Hue Bridge with Google Home allows you to control your lights via voice command. You can even control speakers from Sony or JBL. Compatibility with other products and services is growing steadily. You can find an overview of all compatible products here. Individual design: With its simple yet elegant design, Google Home fits in with every home decor. Google Home for iOS and Android: Google Home is available for both iOS and Android operating systems, allowing you to control the product with almost any smartphone. You should now be taken step by step through the rest of the setup process in the Google Home app. The Google Home comes with family friendly features that can both keep your kids entertained as well as help them learn. Included are classic games such as musical chairs, as well as Disney games featuring Mickey Mouse or Disney princesses. Trivia games can help educate your kids, while even teaching adults a thing or two they didn’t know before. The Google Home can also tell classic fairy tales, while even getting your kids involved in the fun through interactive stories. Google Home can also help your kids when it comes to getting homework and assignments done. It can help with math, geography, history and the sciences, as well as assist with spelling. The growing popularity of smart home assistants has brought with it increasing concerns about privacy. Some fear that home assistants may pick up sensitive information about their home life or constantly record what’s going on. Google has anticipated this and included ‘wake words’ before voice commands. Simply saying “What’s the weather” will do nothing. You have to preface all commands with the phrase “Ok Google” or “Hey Google” in order for the device to react to your commands. The device also lights up when it is recording, giving you a visual signal to let you know if it can currently hear what is being said. However, it is also possible to completely mute the device so that it won’t hear what is being said even when the wake word is used. In terms of search history, it is possible to delete both single requests and the entire voice history from within the Google Home app. Google takes privacy very seriously - a more comprehensive breakdown of their privacy measures can be found on the Google website. The installation could not be simpler: Click "Add Devices" in the Home app. After the app has detected Google Home, the user interface guides you through the setup. 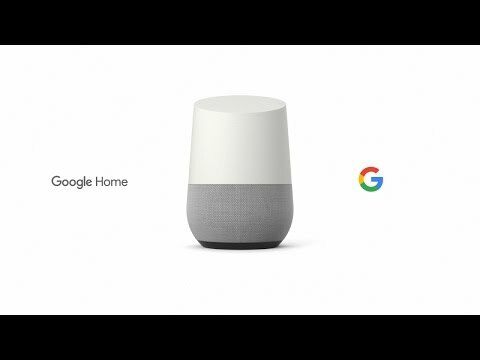 Google Home has access to Google's extensive database. This gives you access to news, data and facts as well as route queries from Google Maps. The Home App connects your Google Home via the Philips Hue Bridge and Google Chromecast with compatible devices. In addition, you can adjust in which rooms streaming services are being played. Google Home controls streaming services and Philips Hue lamps via voice command. It can also save a reminder as a template for future use, such as a weekly shopping list. Further compatible products are regularly being added. Language and voice recognition work well. However, the device only recognizes precise voice commands. Should you run into difficulty, Google Home helps with a wide range of suggestions. Google Home is available in a variety of colors. You’ll soon be able to purchase external cases separately and replace them at any time. You are able to personalize every single device in your home. Google Home only activates when it is addressed directly with "OK Google" or "Hey Google". If you don’t want to use voice commands or the microphone, speech recognition can be turned off manually. Google Home offers a wide variety of functions. It is an alarm clock, scheduler and smart home control center in one package, offered at a fair price. With which partners is Google Home compatible? For more information about compatible products, please visit our Google Home page. What streaming services are supported by Google Home? Note: Google Home is optimized for specific music and audio services only. A subscription or payment may be required. Which mobile devices support the Google Home App? The Google Home App - and thus the Home Assistant - are compatible with Android devices from version 4.2 and iOS devices from version 9.0 onwards. Can I use Google Home Assistant to make phone calls? Call capability with the Google Home Assistant is already available in the US and Canada.